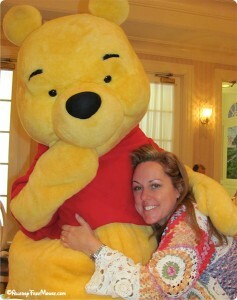 Winnie the Pooh said, “The only reason for being a bee is to make honey. And the only reason for making honey is so I can eat it.” With the movie coming out this week, we thought we would use honey in a recipe. Use your best honey for the recipe below. Preheat the oven to 300 degrees. Butter (Earth Balance) a 9 x 5 inch loaf pan. In a bowl, blend together the sun butter, honey, oil, egg replacer, carrots and bananas. Add the milk, spices, vanilla, salt, baking powder, baking soda and flour. Blend together well. Bake for 1 hour and 15 minutes, or until a toothpick inserted in the center comes out clean. 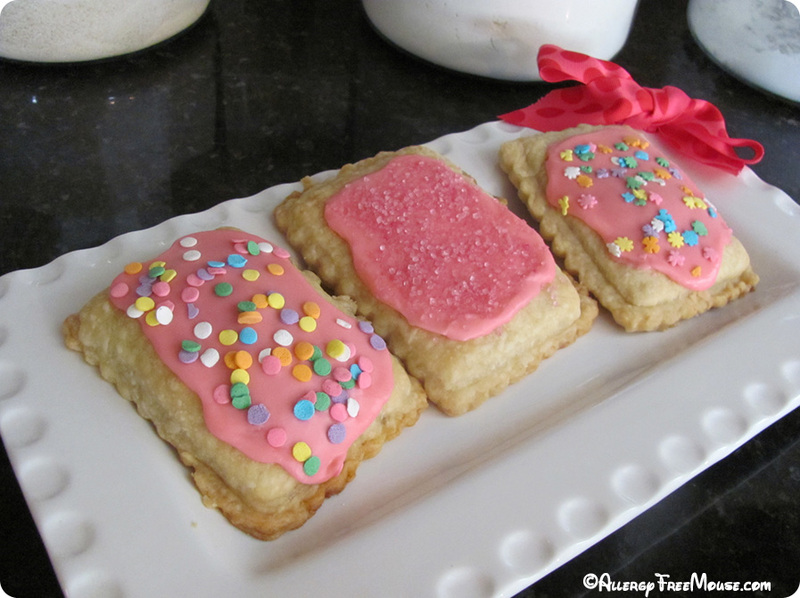 Dairy free pop tarts with frosting and sprinkles. 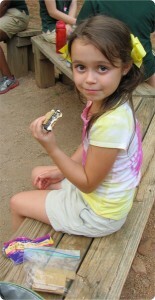 Our daughter had her first pop tart today! 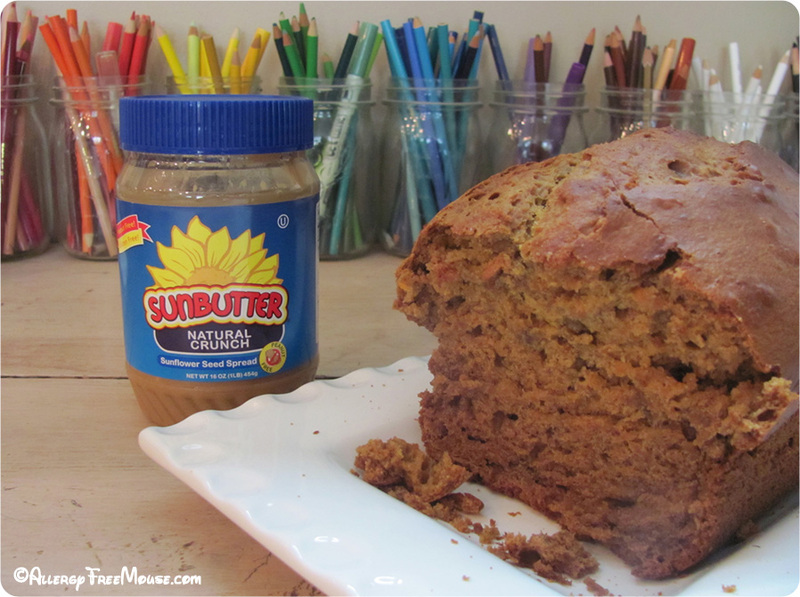 The recipe below is dairy-free and nut-free, but can also be made gluten-free and egg-free. This is a fabulous treat that we discovered in a very interesting way — see below. In a food processor, pulse together the flour, salt and granulated sugar until combined, about 5 pulses. Add the butter and process until the mixture resembles coarse meal, about 10 pulses. Add 6 T. of the ice water and pulse 2 or 3 times. The dough should hold together when squeezed with your fingers but should not be sticky. If it is crumbly, add more water 1 t. at a time, pulsing twice after each addition. Turn the dough out onto a work surface, divide in half and shape each half into a disk. Wrap the disks separately in plastic wrap and refrigerate for at least 2 hours or up to overnight. Line 2 baking sheets with parchment paper. On a lightly floured work surface, roll out 1 dough disk into a rectangle 1/8 inch thick. Using the outer ring of a toaster pastry press mold (Williams-Sonoma), cut shapes out of the dough. Replace the inner ring of the mold inside the outer ring. 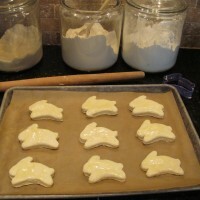 Using a small offset spatula or butter knife, spread 1 T. filling on each of 4 pieces of dough, leaving a 1/2 inch border. Brush the edges with the egg mixture. Top each with a plain piece of dough, place the mold on top and press the inner ring down to seal the edges. Remove the mold. Transfer the pastries to a prepared baking sheet and refrigerate for 30 minutes. Repeat with the remaining dough and filling. Position 1 rack in the upper third and 1 rack in the lower third of your oven. Preheat the oven to 350 degrees. Bake the pastries until golden, about 25 minutes, reversing the positions of the baking sheets on the racks and rotating them from front to back halfway through baking. Let the pastries cool on the baking sheets for 10 minutes, then transfer the pastries to wire racks and let cool completely. In a food processor, combine all ingredients and blend until well combined. Add more powdered sugar if the mixture needs thickening. Combined until a thick icing is formed. Spread on cooled pop tart and sprinkle with cinnamon or mix. THESE ARE NOT TOASTER POP TARTS! REHEAT IN WARM OVEN IF NOT FROSTED! However, they taste great at room temperature! I’m going to try these (omitting the sugar in the dough) with savory fillings, like BBQ chicken, pesto and tomatoes, spicy sloppy joe filling, Italian sausage and Daiya cheese. Wrapped in parchment and foil, they would make a great school snack or lunch item! 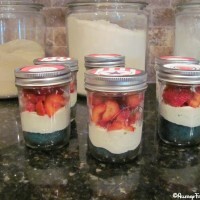 Thanks to one of our Facebook friends who “pinned” our July 4th Mason Jar desserts on her Pinterest page. We discovered this and had to find out more about Pinterest. Wow! I couldn’t believe my eyes! 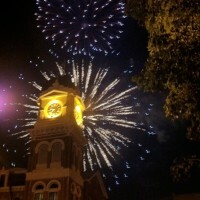 An incredible site for those who love beautiful, visually interesting, images. 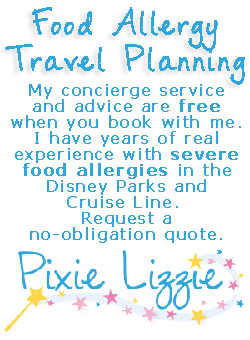 I’ve requested an invite and can’t wait to start my Virtual Pinboard. Even better, one of her pinboards included a link to an image on TasteSpotting. Whoa! This is a visually driven recipe site. Each submission must have a link with more info, by way of a personal blog, news article, video or catalog. In other words, beautiful, stimulating images with links to detailed information for each one. Gotta love it! Thanks also to Williams-Sonoma. The dough recipe was modified from their recipe on the toaster pastry press box. Be our guest, be our guest, put our pop tarts to the test! 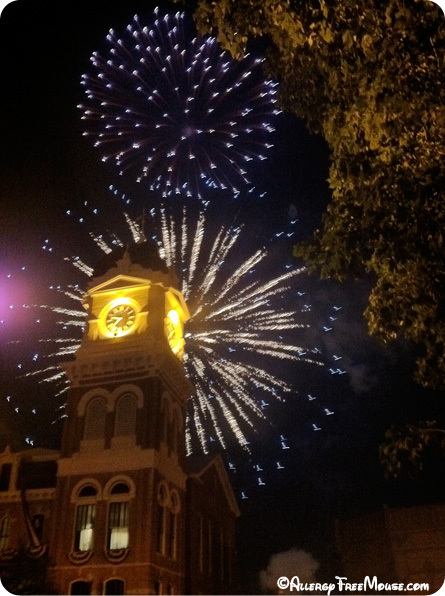 Fireworks above of our town’s historic (built in 1884) courthouse called for a festive, no mess, and easy to transport dessert. I made a blue dairy-free (or a cake free of your allergen) cake with tart lemon frosting, and topped with fresh organic strawberries. I affixed labels to the Mason jars and viola! Individual desserts for everyone in our party. All I had to do was take spoons and napkins, then hand them out to the crowd just before the fireworks! I prepared our dairy-free cake and tinted it blue. Spray the jam/jelly Mason jar with spray oil. Fill 1/4 of the way with batter. Bake on a preheated cookie sheet according to your recipe’s recommended temperature and adjust the time. Our little cakes cooked at 375 degrees for 18-20 minutes. Then I let them cool, while I made the frosting and chopped the strawberries. 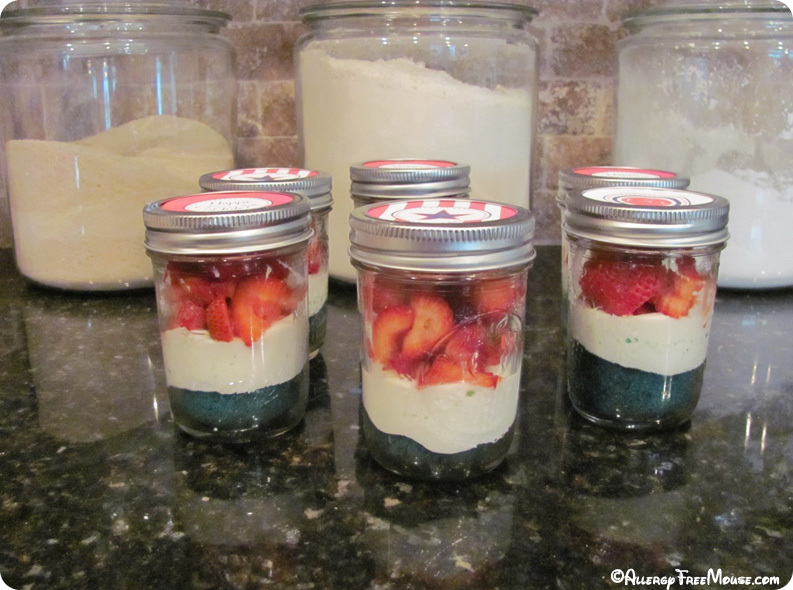 Once the cake was cool, I added frosting in the jar to 3/4 full. Then I topped with the chopped strawberries. Yum! Beat shortening and lemon flavoring for 30 seconds. Add 1/2 of the powdered sugar and 2 T. of milk. Beat well. Add in remaining ingredients. Add more powdered sugar or milk until desired consistency. Also add lemon flavoring until desired taste! 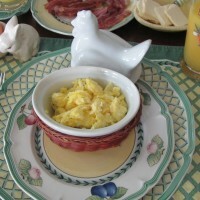 Allow egg whites to stand at room temperature for 30 minutes. Preheat the oven to 375. Beat Earth Balance butter on high speed for 30 seconds. Add sugar and vanilla. Beat until combined. Add egg whites, one at a time, beating well after each. Alternate adding flour and milk, beating on low speed after each, just until combined. Due to allergies, and trying to eat healthier, my wife created this vegetarian Texas “Bowl of Red” chili, that tastes like the real deal. You’ll never miss the meat and it hasn’t been replaced by veggies and tofu. A true Texan would never do that! It’s just great chili flavor! 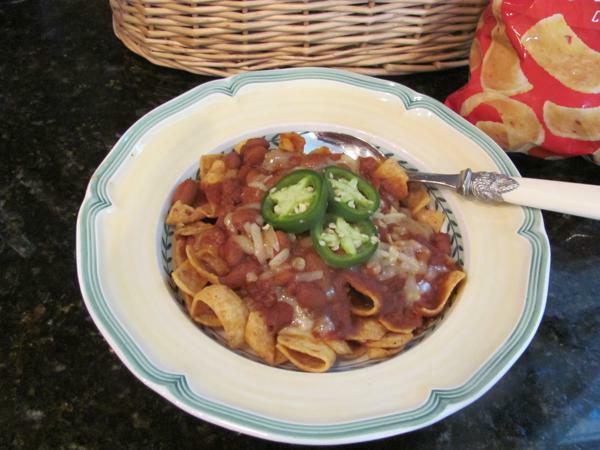 Serve over Fritos and sprinkle with cheese (we used Daiya), fresh jalapenos and onions, if you like. Also great on hot dogs, cheese enchiladas, corn bread and nachos with queso and guacamole. Heat canola oil over medium low heat. Add garlic and onions and cook until crisp-tender, about 4-5 minutes. Meanwhile, soak ancho chilis in 1/2 cup of hot water for about 30 minutes. Add beans to pot, along with remaining ingredients. Remove 2 cups of beans and puree in a blender or food processor, then add back to pot. Drain and puree chilis and 1/4 cup water in blender or food processor, then add to the pot. Bring to a boil, then cover pot, reduce heat to low and simmer for 2 1/2 hours, stirring occasionally. Russell (from Up!) 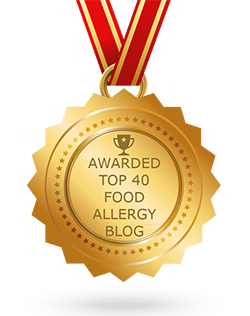 would be getting his “Assisting Those with Food Allergies” badge with this recipe! 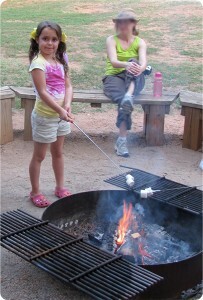 The end result - a yummy dairy free s'more! This past weekend we attended a Girl Scout camp. It was really hot in the middle-Georgia heat, but we had a blast. 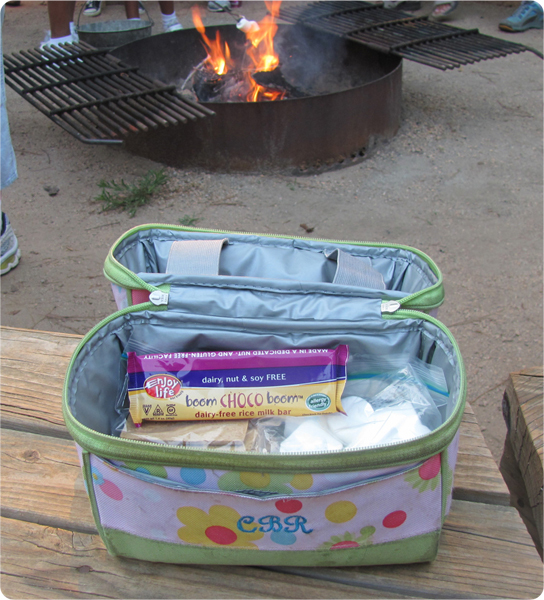 One of the highlights of camping, of course, is making S’mores. In order to keep it dairy free, we took along some Enjoy Life Boom Choco Boom chocolate bars, Kinnikinnick S’morables graham crackers, and some marshmallows. The results were delicious and Charlotte and I really enjoyed them. 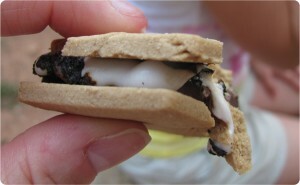 Yes, this dairy free s'more is delicious! 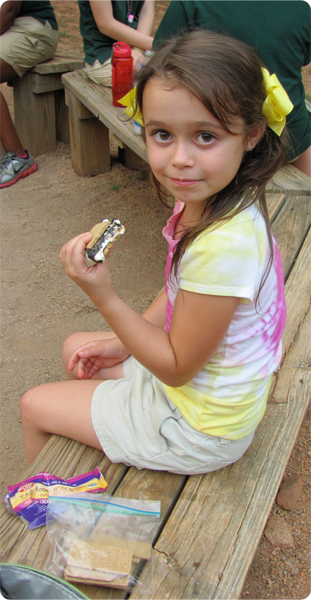 What a delicious treat for any child, especially a Girl Scout with food allergies. This is the best way to eat scrambled eggs. They’re really rich and creamy, because we use So Delicious Coconut Milk Creamer. But you don’t taste coconut, just creaminess. That’s it. Whisk them all together and scramble them over medium low heat in a pan sprayed with a non-stick cooking spray, until your desired firmness. 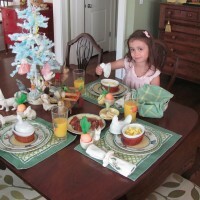 Here’s our happy little one enjoying them with Easter breakfast. These are the best – a classic recipe we tweaked to be dairy free, using So Delicious Coconut Milk Creamer, Earth Balance Buttery Sticks. 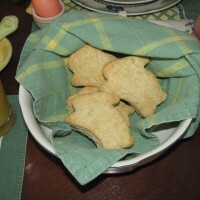 They taste just as delicious as traditional biscuits and are light and flaky. In a bowl stir together flour, baking powder, sugar and salt. Cut in Buttery Stick slices until mixture resembles course crumbs. 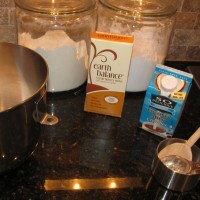 Make a well in the center; add coconut milk creamer all at once. Stir just until the dough clings together. On a lightly floured surface, knead dough gently for 10 to 12 strokes. Roll or pat dough gently to 1/2 inch thickness. 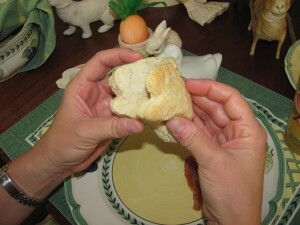 Cut with a 2 1/2-inch biscuit cutter (we used a bunny shaped cutter for this), dipping cutter into flour between cuts. Transfer biscuits to a baking sheet and brush with melted buttery stick. Bake in a 450 degree oven for 10 to 12 minutes or until golden brown. Serve them while they’re warm.